Registration for the RBI Grade B officers recruitment 2018 began today on the official website the bank. India's central bank, Reserve Bank of India (RBI) had earlier announced the recruitment process for 166 Grade B officers and the detailed notification in this regard was released today. As part of RBI Recruitment 2018, the registration process for Grade B officers will go on till July 23, 2018 and the prelims and the mains exam will be conducted on August and September, 2018. The registration process is being held on the opportunities link of the official website at opportunities.rbi.org.in. 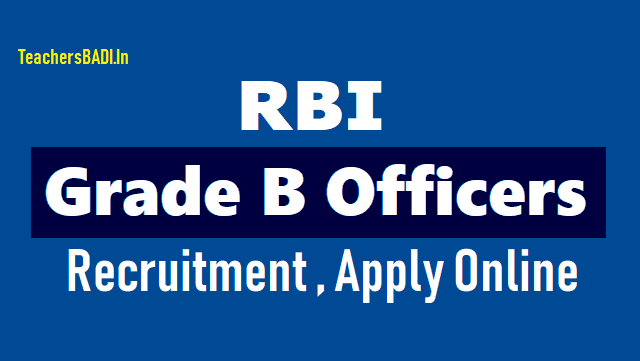 The RBI Grade B officers recruitment will be held for three posts; Officers in Gr B (DR) General, Officers in Gr B (DR) DEPR and Officers in Gr B (DR) DSIM. Reserve Bank of India (RBI) has invited application form eligible candidates for the posts of Officers in Grade 'B' (General) - DR, DEPR and DSIM in Common Seniority Group (CSG) Streams. There are a total of 166 vacancies including backlog vacancies. Eligible candidates can apply online through the official website for RBI. The application process began yesterday and will continue till July 23, 2018. The phase I examination for all three advertised posts will be on August 16, 2018. Phase II examination will be held on September 6 and September 7. Detailed schedule can be found in the official notification which is available on the RBI website. Selected candidates will draw a starting basic pay of Rs. 35,150/- p.m. in the scale of Rs. 35150-1750 (9)-50900-EB-1750 (2)-54400-2000 (4)-62400 applicable to Officers in Grade B and they will also be eligible for Dearness Allowance, Local allowance, House Rent Allowance, Family allowance and Grade Allowance as per rules in force from time to time. A candidate must be at least of 21 years old and must not be over the age of 30 years on the 1st of July, 2018, that is the candidate must have been born not earlier than 2nd July, 1988 and not later than 1st July, 1997. For candidates possessing M.Phil. or PhD degrees, the upper age limit will be 32 and 34 years respectively. For category-wise relaxation in upper age limit, check detailed notification. Note: Candidates should refer to the detailed notification for other eligibility conditions such as academic eligibility, nationality etc. The selection process will involve Phase I exam. Those who qualify in Phase I exam, will move to Phase II exam. The final round in selection process is interview. Candidates are required to apply only ONLINE through the Bank's website www.rbi.org.in. No other mode for submission of application is available. Brief Instructions for filling up the "Online Application Form" are given in Appendix-I published on the official website of RBI.